To maximize protection of walls and other outer surfaces of structures, owners usually use elastomeric paint as their first coating option. There are distinct advantages in using elastomeric coatings. However, improper use and application of this versatile protective product may produce inferior protection against the elements. They are among the best coatings used for stucco, poured concrete and masonry surfaces because of their waterproofing properties. You are assured that your house is protected from the rain and water damage from properly-applied elastomeric coatings. Elastomeric paint is at least 10 times thicker than conventional paints. It attains greater dry film thickness (DFT) than ordinary paints at 10 to 20 mils per coat against 2 to 3 mils for paints. The extra thickness translates to added protection to wall surfaces. Elastomerics can stretch and fill small gaps in the wall. They are also very tolerant to small substrate movements. They can serve as flexible coatings between cracks. They can also adopt to expansion and contraction of walls during cold and warm weathers. A single attractive feature of this product is its durability. Manufacturers, in fact, give up to 10-year warranty for elastomeric coatings compared to the usual 2-year warranty for ordinary paints. Its waterproof quality is another reason why owners use this product for their buildings. 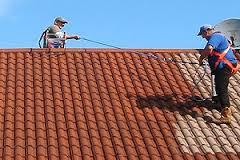 A direct and positive effect of this is the prevention of shortened and expensive reroofing. Wrong application will result to lumpy and ugly texture. To remedy, apply multiple coatings instead of just one. Some products do not specify the required coatings. A good description must specify the dry film thickness (DFT) and the number of coats required. Viscosity of elastomeric coatings is different from conventional paints. Inexperienced painters may inadvertently thin and weaken the coating. Water thinning is not recommended because it is difficult to gauge compared to a solvent. Ratio should be 60 to 100 square feet coverage per gallon to achieve ideal thickness. They are more expensive than ordinary paints. Elastomerics do not penetrate the substrate surface. Larger cracks must be repaired before application of the coating. Be sure to remove dust and dirt before application otherwise adhesion may be affected. Backrolling is required after spray coating and before the next application of elastomerics. Most painters do not do this unless specified in the project. When paint begins wearing off the surfaces it is on, the structure underneath will often crack. This is especially true with wood and stucco. Stone and metal can also crack, and any exposed metal may become rusty over time. Another type of material that is notorious for cracking is T-111 siding. Some people try to fill cracks with caulk, paint or other substances. However, the underlying damage still exists. The ideal solution is to prevent that damage in the first place. One of the easiest ways to do this is to use elastomeric paint. It is also known as rubberized paint, because it leaves a rubbery surface that is tough and water resistant. This type of paint is very thick and has unique elongation capabilities, which means it can repair hairline cracks and bridge slightly larger ones. People who have stucco or wood surfaces that are cracked often choose this type of paint rather than replacing the cracked materials. With this type of paint, there is no need for many coats. Two coats over primer is enough to repair minor cracks and prevent water from entering. This form of paint is also long lasting. While a good acrylic paint may last about 10 years in favorable conditions, this form of coating will last much longer. As it is with anything of higher quality, the price will be reflective. In comparison with the cost of regular paint, this type costs about 50 percent more overall. The higher price is due to a smaller spread rate and the rising cost of paint per gallon. Although it is more expensive than most other paints used in or on a home, it does last longer and is not so expensive that it is not affordable. 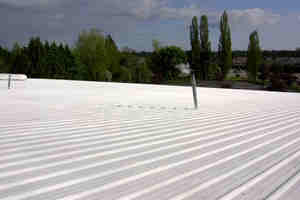 It is one of the most favored rubber roofing materials, and is sometimes considered a liquid rubber roof compound. 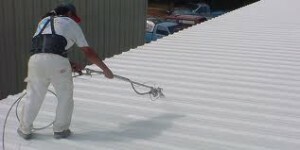 As metal roof paint, it stands up better to temperature changes and direct sunlight. Over time, most paints crack in the sun or due to significant temperature changes. However, the elasticity in this type of coating that makes it unique also makes it more resistant to seasonal changes. Many home and business owners consider this rubbery paint an investment. For example, a person could use this type of paint for about the same price as what it would cost to fill cracks and deal with peeling acrylic paint repeatedly for the same amount of time. It is also important to remember that peeling paint over a damaged surface will lead to further damage. Repeatedly repainting a surface that is cracked and eventually peels again will lead to quicker wear of the underlying material, which is far more expensive to replace than paint. Only an experienced professional should apply elastomeric paint to a surface. Coatings can be applied using rollers or airless sprayers. It is easy to see why so many people are choosing this type of paint. In comparison with the best acrylic paint, it is durable enough that it can outperform any acrylic paint two to one.